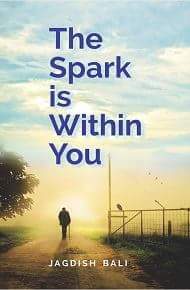 The Spark is Within You is a motivational self-help book. The book deals with the various aspects of human life – from birth onwards. It will inspire the readers to move forward in Life. Author’s personal experience, anecdotes, small stories, quotations and references from the lives of great and successful people make the reading juicy, interesting and entertaining. As truth is for those who accept it, this book is for those who are ready to squeeze out lessons from it for happy and better life. As aloe vera imparts glow to cheeks, this book will rejuvenate lives of those who are feeling over and out. They will respond as thirsty plant responds to water. It will prove an elixir for them. One can find enough in the book to shape and reshape, build and rebuild oneself. Posted by Publication on 11/11/2016. Filed under पुस्‍तकें. You can follow any responses to this entry through the RSS 2.0. Both comments and pings are currently closed.